MILWAUKEE – Next Spring on April 4, 2014, two icons of freedom will roll onto the silver screen with the release of Marvel Studios™ "Captain America: The Winter Soldier." Fans at San Diego Comic-Con were excited to see exclusive footage of the film including the reveal of Steve Rogers' choice of Harley-Davidson® in this movie. In the upcoming film, Steve Rogers' character will be riding Harley-Davidson's newest Softail® motorcycle, the Breakout. Launched to the world in March, the Breakout makes a modern statement, but harkens back to the timeless aesthetics for which Harley-Davidson is known. "Captain America and Harley-Davidson have had a long and glorious association dating back to the introduction of the character in 1939," said Dino Bernacchi, Harley-Davidson Marketing Communication Director. "He's ridden different Harleys throughout the history of the character, and his bike for "Captain America: The Winter Soldier" needed to fit the modern day setting of this story. Our newest model, the Softail Breakout, with custom touches that personalize the bike for his character was the perfect choice for this film." 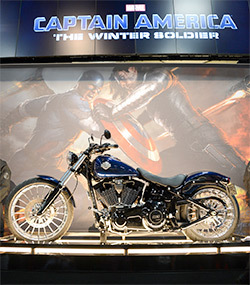 Starting in 2011 with Captain America: The First Avenger, and continuing in 2012 with Marvel's The Avengers "Assemble Your Freedom" contest and recently with Marvel's Iron Man 3 "Man & Machine" contest, the collaboration between Harley-Davidson and Marvel has successfully connected these two powerful and inspirational brands. "Captain America makes the perfect marketing partner for Harley-Davidson as he truly embodies the iconic, heroic, and American aspects of our brand," said Bernacchi. "Both Captain America and our motorcycles are great symbols of freedom." Marvel Entertainment, LLC, a wholly-owned subsidiary of The Walt Disney Company, is one of the world's most prominent character-based entertainment companies, built on a proven library of over 8,000 characters featured in a variety of media over seventy years. Marvel utilizes its character franchises in entertainment, licensing and publishing. For more information, visit marvel.com. After the cataclysmic events in New York with The Avengers, Marvel's "Captain America: The Winter Soldier" finds Steve Rogers, aka Captain America, living quietly in Washington, D.C. and trying to adjust to the modern world. But when a S.H.I.E.L.D. colleague comes under attack, Steve becomes embroiled in a web of intrigue that threatens to put the world at risk. Joining forces with the Black Widow, Captain America struggles to expose the ever-widening conspiracy while fighting off professional assassins sent to silence him at every turn. When the full scope of the villainous plot is revealed, Captain America and the Black Widow enlist the help of a new ally, the Falcon. However, they soon find themselves up against an unexpected and formidable enemy - the Winter Soldier. Based on the ever-popular Marvel comic book series, first published in 1941, Marvel's "Captain America: The Winter Soldier" is produced by Kevin Feige, directed by Anthony and Joe Russo, from a screenplay by Christopher Markus & Stephen McFeely, and stars Chris Evans, Scarlett Johansson, Sebastian Stan, Anthony Mackie, Cobie Smulders, Frank Grillo, Emily VanCamp, and Hayley Atwell, with Robert Redford as Alexander Pierce and Samuel L. Jackson as Nick Fury. "Captain America: The Winter Soldier" is presented by Marvel Studios. The executive producers are Louis D'Esposito, Victoria Alonso, Michael Grillo, Alan Fine and Stan Lee. The film releases April 4, 2014, and is distributed by Walt Disney Studios Motion Pictures.